John MacArthur, Steve Lawson, Stephen Nichols, Nathan Busenitz and RC Sproul gathered together at Reformation Bible College to consider together the subject of our great salvation. As R.C. Sproul has said, the most serious problem we face as humans is that “God is holy and we are not.” During our 2015 Fall Conference at Reformation Bible College, we considered this problem and addressed the scope of the biblical gospel. Hosted in partnership with The Master’s Seminary, the conference featured Dr. John MacArthur as our special guest. In addition to those attending Fall Conference, we were joined this weekend by prospective Reformation Bible College (RBC) students as they took classes during the college’s Preview Weekend, spent time meeting with faculty and current students, toured the campus, and joined us for RBC’s fifth annual convocation service on Friday evening. You can read highlights here. The conference is currently free to stream video or audio. Al Mohler moderates a panel discussion with Tom Schreiner, Mark Seifrid, Denny Burk and Brian Vickers at Southern Baptist Theological Seminary. The topic of their discussion is N. T. Wrights revisionist view of justification. This was a very good interview about justification and the challenges raised against it today, and the importance that we deal with this kind of error firmly. Ligon Duncan and John Piper join Al Mohler on his radio program to discuss the doctrine of justification and the challenges posed by the New Perspective on Paul. Guy Prentise Waters gave two interesting messages on some very important doctrinal points that play heavily in justification. Waters compares and contrasts Adam and Christ, the Old Covenant and the New, and the implications they have in terms of righteousness. While I love Guy Prentise Waters, these two messages required more than the usual amount of attention. They are lectures, and as such, are a bit on the dry and monotone side of things. The information is great. But the format of the delivery will require work for the listener. Not commuter friendly audio. Be warned. The boys at Christ the Center give us a 2 part discussion with Guy Prentiss Waters about N.T. Wrights new book ‘Justification: God’s Plan and Paul’s Vision‘. Wright’s book is a response to John Piper’s book The Future of Justification, which itself was written in response to Wright’s teachings on Justification which provide the most theological weight to what’s become known as the New Perspective on Paul. While this isn’t a discussion for everyone, it is very helpful in providing a big picture of this theological engagement. Waters and the CTC team are not supportive of Wright’s conclusions, and they point out some major flaw’s in Wright’s arguments in his new book as he tries to engage with John Piper’s masterful critique. Richard Gaffin, Professor at Westminster Theological Seminary, joined the panel at Christ the Center to discuss the relationship of the gospel with sanctification, and how sanctification relates to justification. This was a very interesting and helpful discussion. Gaffin challenged the prevalent idea that once justified, our sanctification is simply to perform the law out of gratitude to God. Gaffin clearly outlines how our sanctification is dependant upon Christ, and not merely a response of gratitude, but an actual working of the Spirit of God in our lives to perform good works as we are God’s workmanship, and not the other way around. The Theology Network’s Table Talk interviewed John Piper on the subject of Justification. As you may know, John Piper has held up the banner in defending the biblical doctrine of justification and imputation from modern day critiques within the church. His book Counted Righteous in Christ is a very strong defense of these doctrines. If you’re new to the challenges being raised against these doctrines, this interview would be a good place to start. Piper discusses the difference between justification and imputation, and explains why these are important. He also covers the ‘external righteousness’ idea that defines historic, biblical Christianity. The discussion is very clear and stays on a very accessible frequency. Fascinating interview with John Fesko and the team at Christ the Center iabout the subject of Reformed Justification. 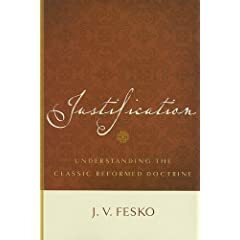 Fesko recently published a book ‘Justification; Understanding the Classic Reformed Doctrine’, with the intention of providing a resource that is a one-stop shop, so to speak, on Reformed, historical Justification. Fesko touches on N.T. Wrights error as well as the position of the federalist vision. Fesko argues very convincingly that the death Adam faced at the fall was not primarily a postponment of physical death. He brings Scripture to support an ‘exile’ death, as Ezekiel described the death of Israel as a death of exile. Given that life is to be in the presence of the Lord, death is to have that presence removed, which is what happened in the Garden. Fesko also draws a number of very interesting parallels between the first Adam and second Adam, and their representative natures. For example, the Old Testament describes Israel coming out of the Red Sea and God descending upon them hovering like a bird to protect them, and Fesko connects that imagery to Christ coming out of the waters of baptism and the Spirit of God descending upon him like a dove. Election is a crucial element to the proper understanding of justification, and Fesko makes that case and discusses how justification can become skewed without it. Fesko is the pastor of Geneva Orthodox Presbyterian Church of Woodstock, Georgia, and adjunct professor of theology at Reformed Theological Seminary in Atlanta. The team at Christ the Center gives John’s book a sweeping recommendation for it’s clarity, accuracy and readability. Grudem carefully looks at the doctrine of Justification and briefly tackles the New Perspectives on Paul which challenges the traditional Reformed understanding of Justification by faith alone. The doctrine of Adoption is a great cause of praise in how we have been given the great priviledge of being God’s son’s and daughters, and fully enjoy the benefits this status. Derek Thomas delivered a series of 4 messages at the Oklahoma City Conference on Reformed Theology in October of 2007. The subjects of the messages cover Reforming our Understanding of God, Justification, Evangelism and Holiness. A final Q&A is also available. Derek draws deeply from church history and the Reformers, and also takes a considerable amount of time to review the New Perspective of Paul.